Reading Partners provides one-on-one reading instruction to elementary school students reading below grade level to help them succeed in school and in life. With locations in 10 states, Reading Partners' one-on-one tutoring model equips children with individualized instruction and empowers youth with the literacy skills necessary to achieve their full potential as lifelong learners. In 2013, only 13% of 4th graders who received free or reduced price lunch in DC demonstrated reading proficiency on the National Assessment of Education Progress test. A report from the Anne E. Casey Foundation found that low-income students reading below grade level in 3rd grade were four times less likely as their peers to graduate from high school. With such low literacy rates among the children, District youth are not currently positioned for success in their communities. 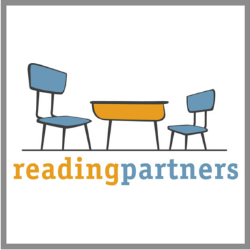 In 2010, Reading Partners DC began to organize volunteers to help students from 18 low-income schools improve their reading skills. At each school, 40-100 volunteers are trained to provide one-on-one instruction to students in a designated reading space. Student-tutor pairs meet twice a week for 45 minutes. By referencing multiple data points collected from these sessions, as well as anecdotal evidence from tutors, the Reading Partners program team gauges the specific needs of each student. Reading Partners collects data from a variety of sources during each tutoring sessions to inform their individualized instruction model. In combining literacy assessments administered by Reading Partners, academic assessments such as standardized test scores and school-based evaluations, and perceived improvements in students’ abilities from school staff and tutor surveys, Reading Partners employs both empirical and analytical data to provide a holistic view of each student’s success. During the 2013-2014 school year, 97% of the 604 targeted students enrolled in a Reading Partners program improved in reading proficiency, thereby decreasing the achievement gap by 87% with their peers who read at grade level. An evaluation in the same year confirmed volunteers using the Reading Partners evidence-validated curriculum made a positive impact on student improvement. Since Reading Partners' inception in DC, student enrollment has grown 20% annually and, in 2015-2016, approximately 1,000 Reading Partners DC volunteers are projected to serve 900 District youth.